If someone asked me how the internet stays running, I'd probably say something like, "Bash scripts and cat photos." Because really, those two things pretty much encompass the human online experience. Bash scripts are quick snippets of timing-saving code, and cat photos are, well, photos of fluffy kitties. Most days, that's enough. Although I won't say this issue is based on that premise, I'd like to pretend that's the case! Reuven M. Lerner starts things off with how to create multithreaded applications in Python. (See? Thread/yarn? The whole world is cats!) Usually the tasks we need computers to perform are so simple, the computer can do them one at a time faster than we can blink. But, what if those tasks are time-consuming? Multithreading is a great way to force computers to do more work at once. Dave Taylor follows with an article on Bash scripting inside Windows. Yes, even in Windows Bash scripts rule. I think my theory is proving itself. Kyle Rankin talks about taking a vacation again this month. Specifically, he talks about purchasing a cheap laptop that can be taken on vacation or used when on call without concern about it getting stolen or damaged. Sure, most tech folks spend a few minutes on vacation solving a work issue, but why tote your fancy everyday computer along with you, when a flimsy keyboard and outdated CPU will work perfectly fine for five minutes of work? In fact, if you read my article this month on Ansible playbooks, you might need less than five minutes to solve problems back home. Ansible automation really starts to shine when playbooks are added to the mix. Jim Hall takes my cat theory to a very literal degree. This month, he shows how to create your own CAPTCHA system, but rather than proving human-ness, your CAPTCHA can test personal information. In Jim's case, his CAPTCHA displays a bunch of cat photos, and you need to pick which cat is his. For friends, it's a simple test. For strangers? Not so much. Might it be tempting to answer incorrectly in order to see more cats? Yes. But, that's one of the dangers of using cats. Their fluffiness is hard to resist. Andy Carlson finishes off the issue with an indepth look at Bash itself. We all know a handful of tricks Bash can do easily, but what about things like encryption? Our ever-vigilant scripting language is so versatile, even seasoned professionals like myself are likely to find useful tips and tricks we never realized were possible. 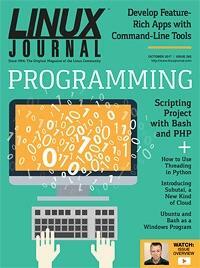 Speaking of tips and tricks, this issue of Linux Journal might focus on fluff and scripting, but it's also full of the same tech tips and useful programs you've come to expect every month. We also have new product announcements, updates about the tech world, and insight on technology in general. This was a fun issue of Linux Journal, and it contains far more cat photos than most. Although, that might be a shortcoming of the other issues, as a certain number of cat photos should be considered baseline, no?